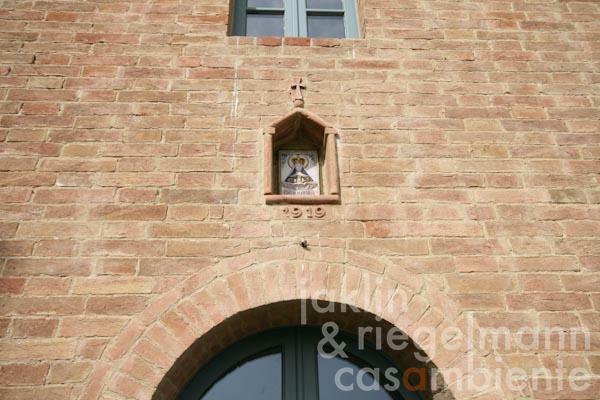 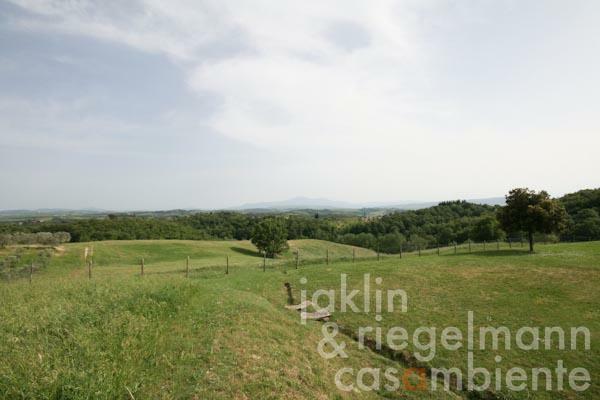 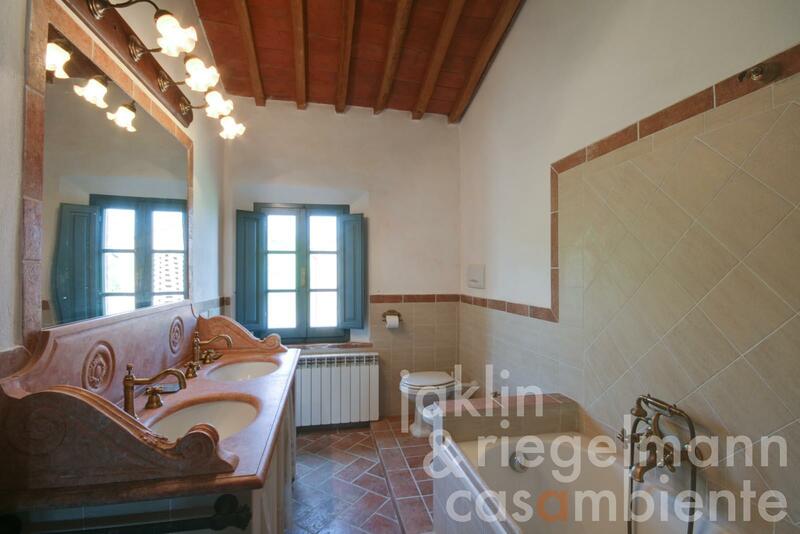 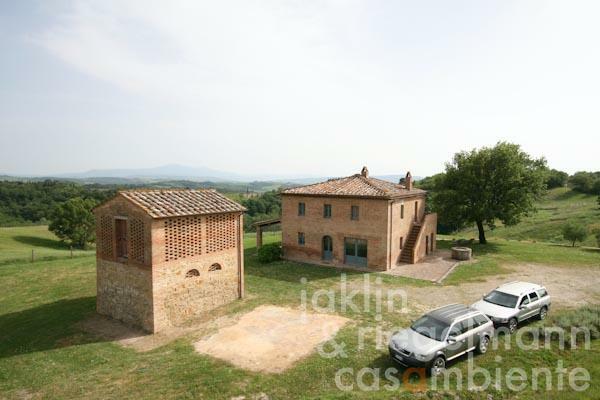 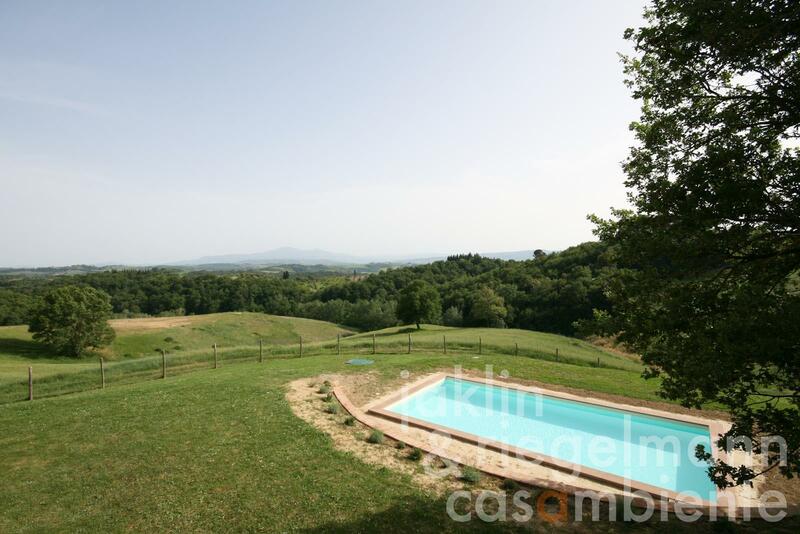 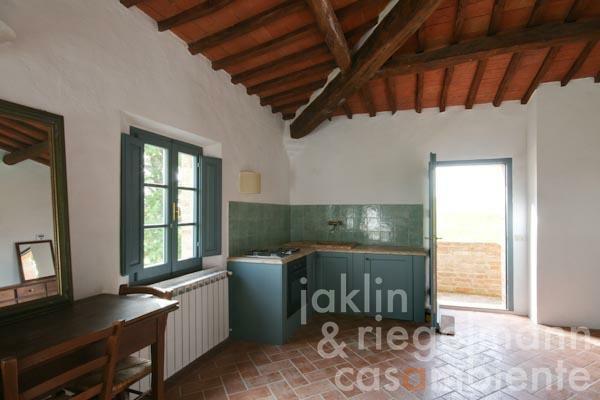 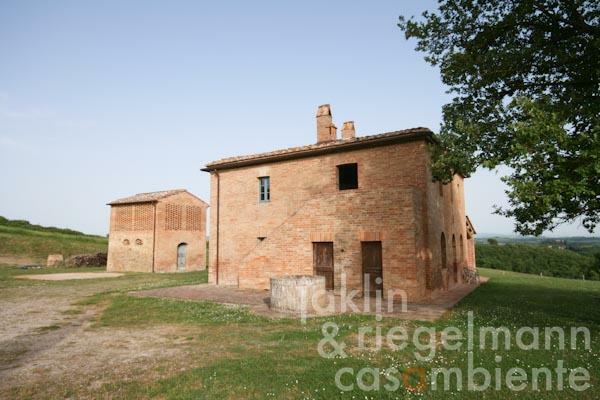 This property for sale is located in the Province of Siena, Comune of San Giovanni d’Asso, about 40 km from Siena, 30 km from Montepulciano, 20 km from Montalcino, and 20 km from Pienza. This marvellous property is reached by an unpaved road and comprises about 2.3 hectares of land. It is located in the Orcia DOC wine production area and includes an olive grove with 150 trees currently in production (Tuscan IGT olive oil), and a panoramic pine and cypress grove. The property enjoys far-reaching, pristine views of the countryside, encompassing Monte Amiata and Monte Cetona, the Orcia valley and the towns of Montepulciano, Montalcino and Pienza. 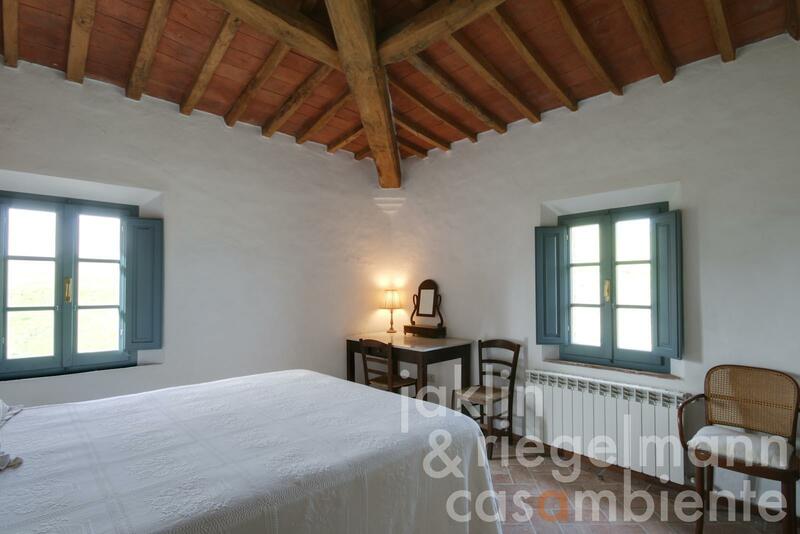 The property is accessed through a wrought-iron automated gate that leads to the large fenced area that comprises the structures, pool, extensive lawns, and a magnificent century-old oak. The two-storey house with approximately 200 m² is built in typical Tuscan style with hand-made bricks and tiles, chestnut beams and new wooden doors and windows with low emission double glazing. The ground floor, which is connected to the second floor by an internal and an external staircase, offers an entry, living room, dining room, kitchen with fireplace, bathroom, study and storage closet. On the ground floor the interior finishes remain to be customized (bathroom tiles, flooring, and kitchen counter and cabinets). 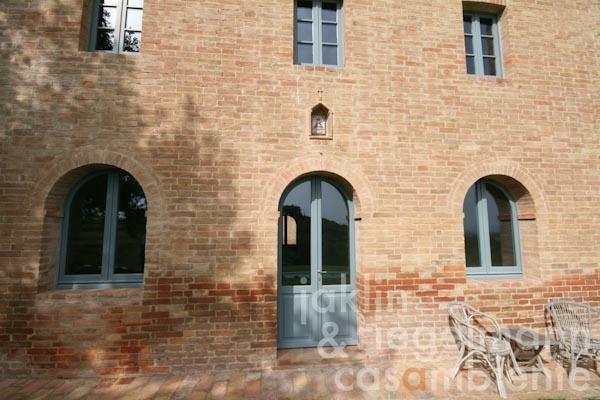 Attached to the house is a 30 m² loggia connected to the living room by large french doors, and two utility rooms (boiler and storage). 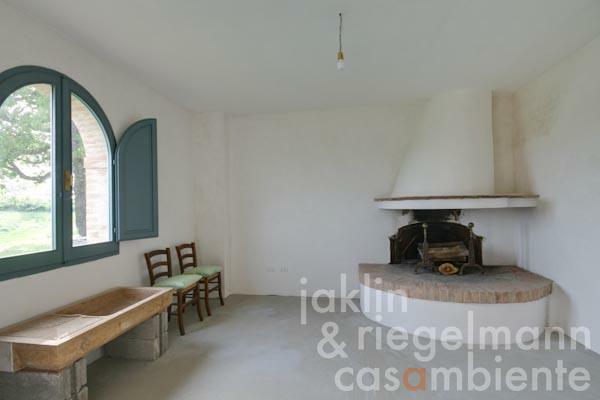 The second floor is divided into a living room with fireplace and kitchenette, three bedrooms, two bathrooms and a storage attic. 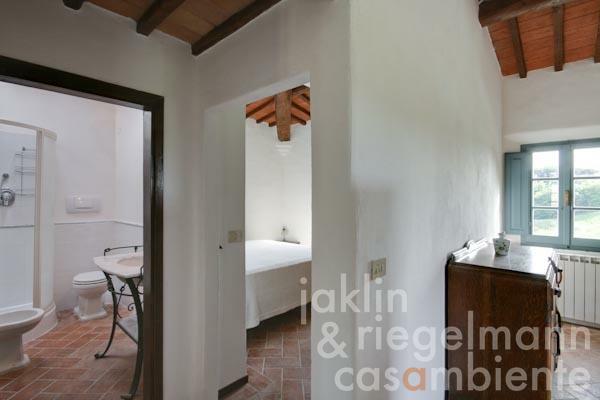 Part of the second floor can be used as a guest wing, separate from the main bedrooms, with independent access from the exterior staircase. The heating and hot water are supplied by a propane boiler with a 1750 litre in-ground fuel storage tank. 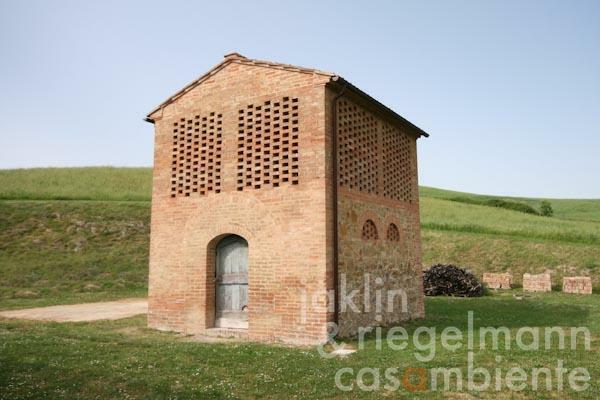 The water supply comes from the Fiora Aqueduct as well as a cistern that collects rain water. 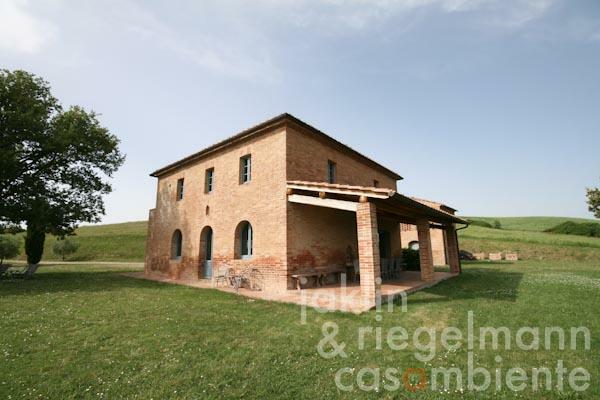 The electric power is buried underground throughout the entire property. 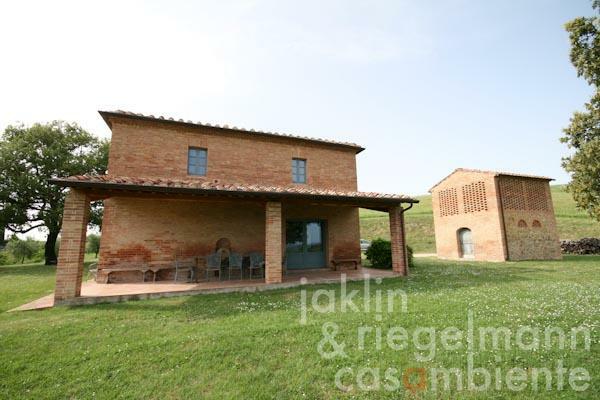 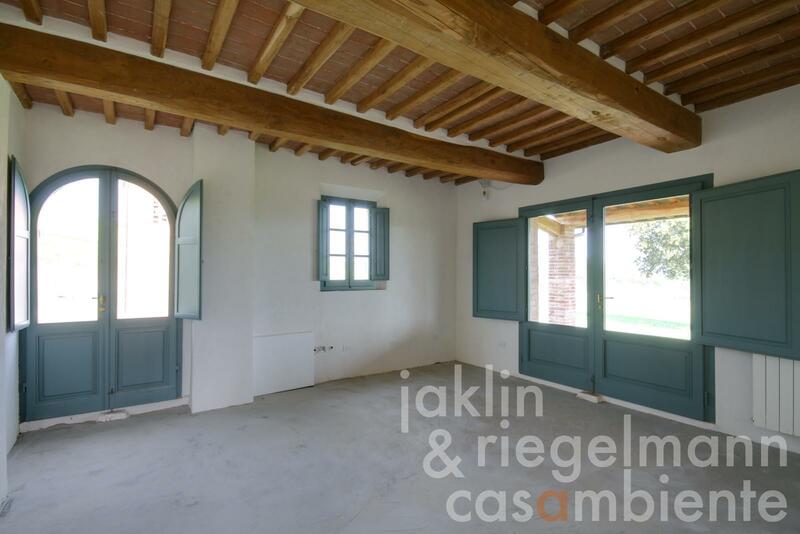 Next to the house there is a two-storey stone and brick barn of approximately 50 m² that has been restored using the same typical Tuscan building materials. 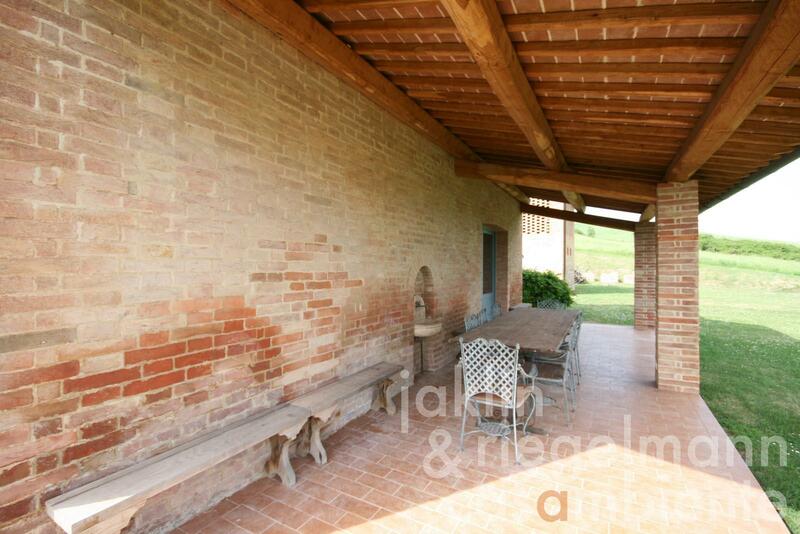 The interior of the barn remains to be customized according to future use. 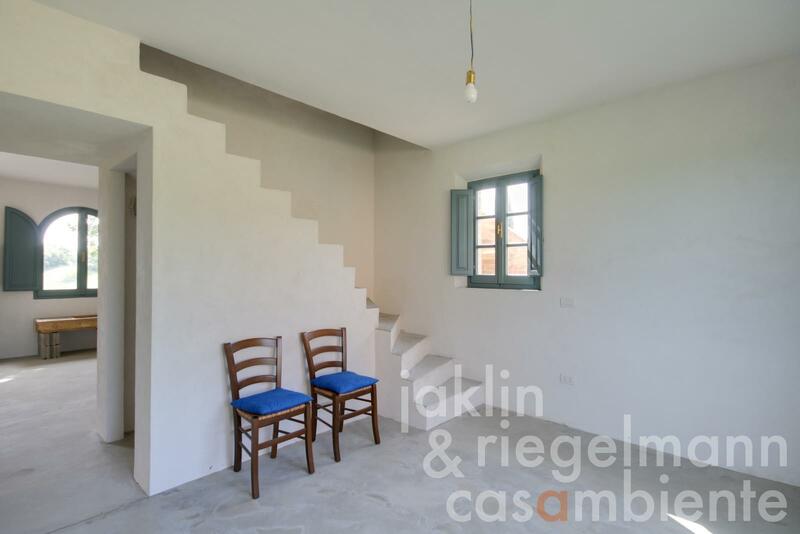 There is an approved building permit to construct an exterior brick staircase to access the second floor. 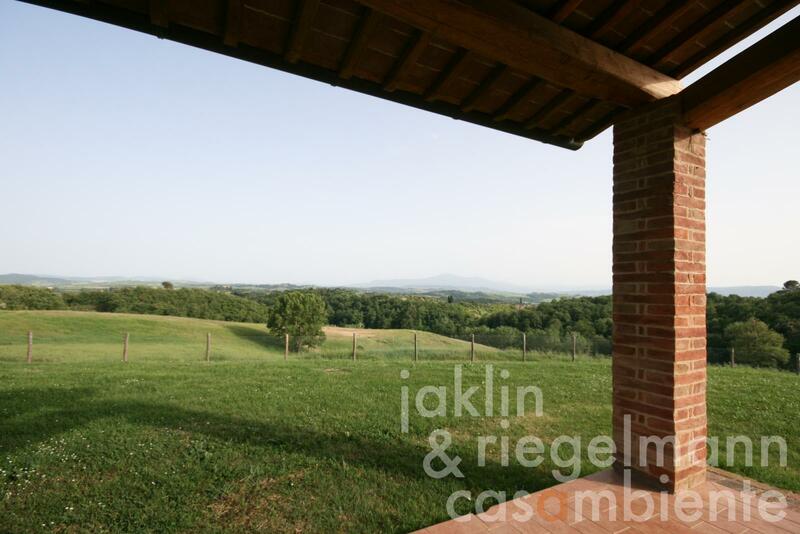 There is also an approved building permit for a 32 m² open barn, and a 40 m² pergola attached to the house. 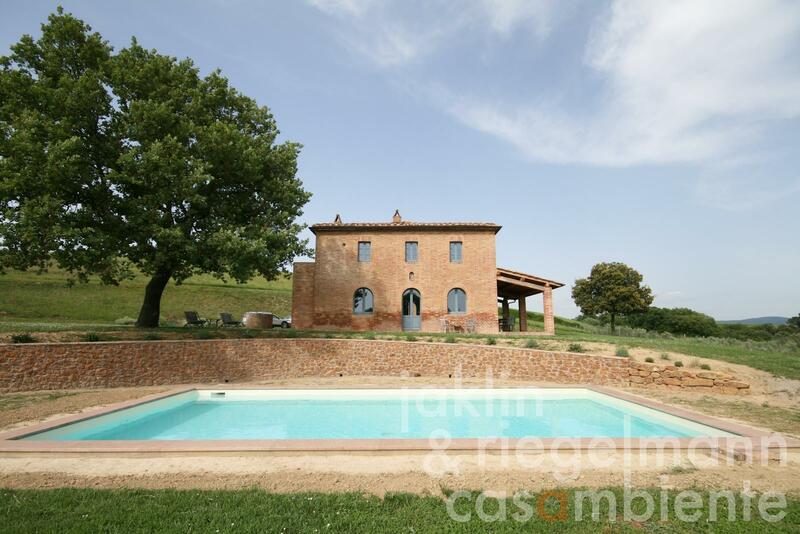 The amazing 50 m² panoramic pool works with a salt system and is surrounded by Mediterranean herbs which define the pool lounging area. 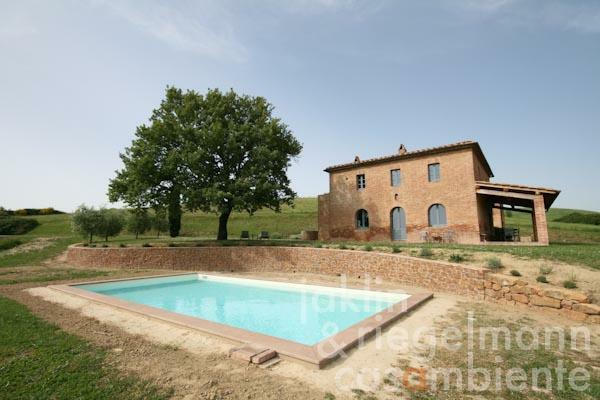 Italy, region Tuscany, province Siena, municipality San Giovanni d'Asso. 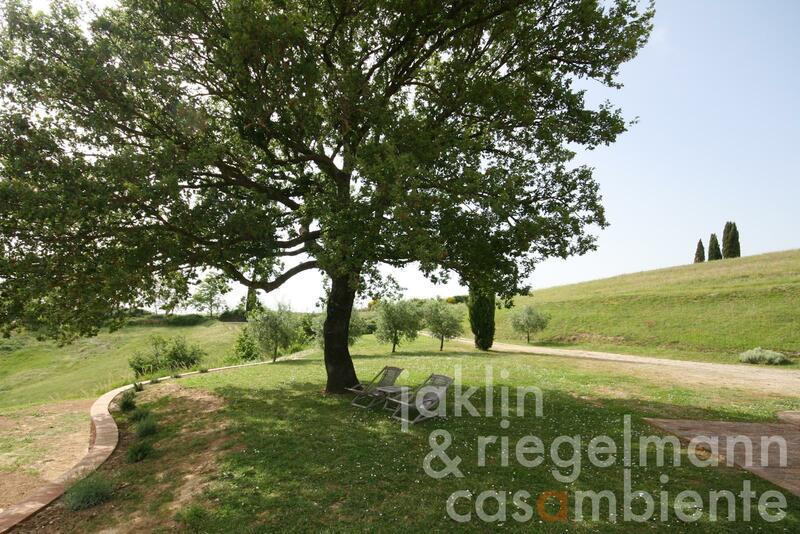 2.39 ha with about 5,000 m² olive grove. 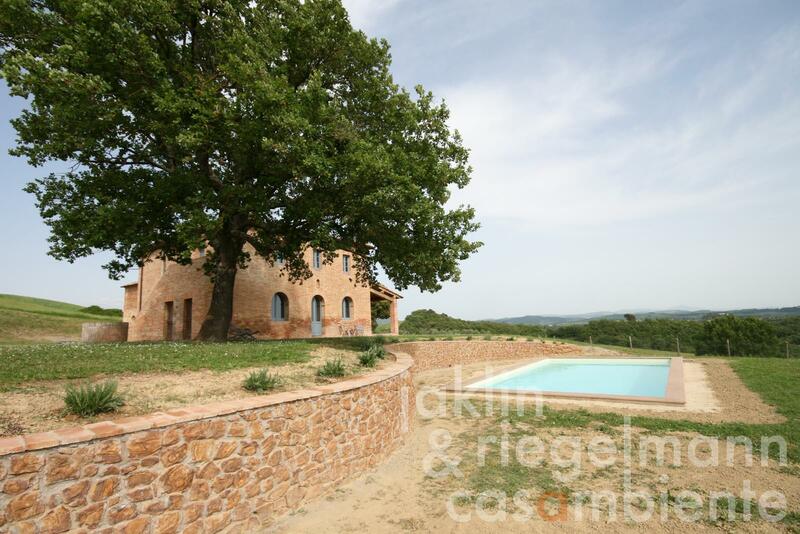 Electricity, rain water cistern, own spring water, central heating, fireplace, gas tank, automatic gate, swimming pool, private parking, terrace, olive grove, garden.